Wintergreen located in the heart of Central Virginia adjacent to the Blue Ridge Parkway, just 90 minutes from Richmond, Va. and approximately three hours from Washington, D.C. and North Carolina. 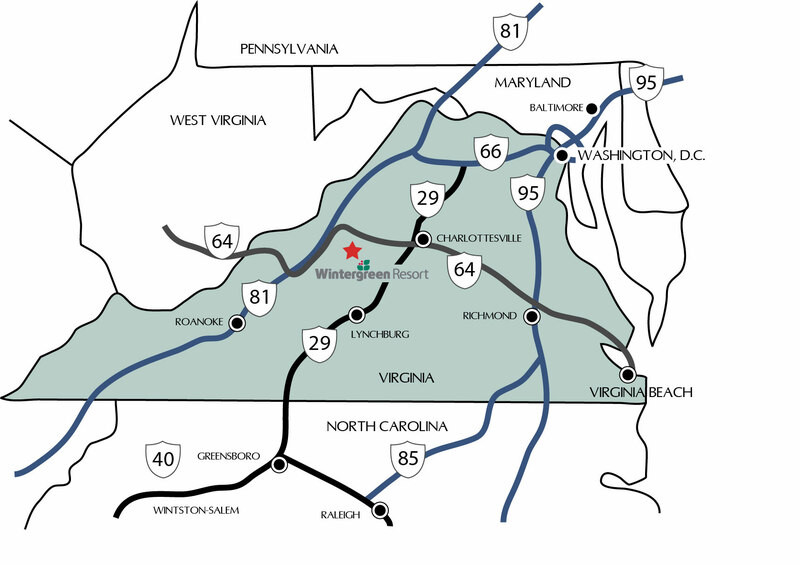 Wintergreen Real Estate offices are located in The Mountain Inn at 39 Mountain Inn Loop, Roseland, VA, 22967. Below, you'll find the best directions for reaching Wintergreen. Please call 434-361-0500 or 800-325-2200 for assistance. IMPORTANT NOTE to our guests using GPS: We recommend routes that use Rt 151 in Nelson County. If your GPS instructs you to take the Blue Ridge Parkway; please check alternate routes using the driving directions below. The Parkway is not recommended during inclement weather including fog, snow or ice and is frequently closed in the winter. Address: "39 Mountain Inn Loop, Roseland, VA" which will take you to the Front Desk and the Mountain Inn. From I-66, take Exit 43A (Gainesville, Rt. 29 South). Follow 29 South to I-64 West (in Charlottesville). Take I-64 West to Exit 107 (Crozet, Rt. 250) Take 250 West to Rt. 151 South, turn left. Follow Rt. 151 South to Rt. 664, 14.2 miles. Turn right and Wintergreen is 4.5 miles ahead on Rt. 664. Map it. Take I-64 West to Exit 107 (Crozet, Rt. 250) Take 250 West to Rt. 151 South, turn left. Follow Rt. 151 South to Rt. 664, 14.2 miles. Turn right and Wintergreen is 4.5 miles ahead on Rt. 664. Map it. Take Rt. 29 North to Rt. 151 North, turn left. Follow Rt. 151 for 21 miles to Rt. 664. Turn left and Wintergreen is 4.5 miles ahead on Rt. 664. Map it. Take I-81 to I-64 East to Exit 99 (Afton, Rt. 250). Take Rt. 250 East to Rt. 151 South, turn right. Follow Rt. 151 South to Rt. 664, 14.2 miles. Turn right and Wintergreen is 4.5 miles ahead on Rt. 664. Map it. Take the Reeds Gap exit (between mileposts 13 and 14). Go east on Rt. 664 one mile to the Wintergreen entrance on your left. It is a beautiful and historic parkway and provides an alternate route to Wintergreen. Please note that during the winter the Parkway is not plowed and is frequently closed. We also do not recommend the Parkway when there is fog. Please use an alternate route. Map it. Please Note: Motorcycles and Motor Homes are not allowed on resort property. Even when snow is piled high, our roads are CLEAR. Our experienced road-clearing crew gets the roads in top shape early after a snowfall. For your convenience when traveling during the winter, please refer to the Virginia Department of Transportation (http://www.virginiadot.org/travel) for Virginia road conditions.